Successfully Added Portable 7 Inch USB Powered Touchscreen Monitor to your Shopping Cart. 7 inch touchscreen USB powered portable monitor to stay organized, save time, and increase your efficiency. What makes this little monitor so great? Well for starters it’s conveniently powered by a single mini USB cable! 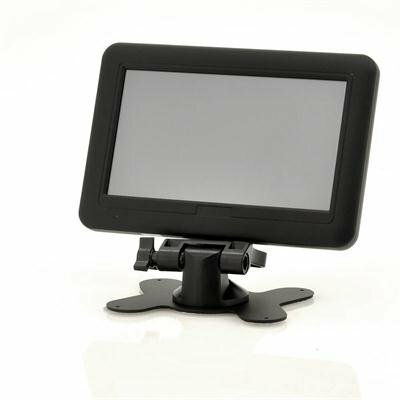 With no VGA cable or power adapter needed, you have the freedom to use this 7 Inch monitor while on-the-go and saving tons of space. And it uses a first class touchscreen that is one of the most responsive and highly accurate touchscreens we have felt in a while. If you’re looking to simplify your life, save time, and increase efficiency, continue reading to learn more. 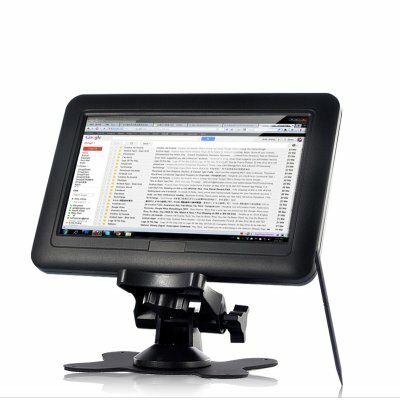 Use the 7 Inch monitor to increase your general productivity. Set it up next to your main PC monitor and use it for real-time outlook/mail monitoring, tactile calendar or to-do lists, view widgets, weather, stock tickers, dictionary, thesaurus etc. or even track your system performance, monitor network traffic or CPU cycles/usage. Or use it as a cost-effective method of having multiple customers register, enter information, and make purchases (Point-of-sale). Set it up as a media controller to access your music, movies and photos. Quickly access important toolboxes or maps for online gaming, run a 2nd or 3rd display without the need for a new graphics card, park your Adobe Creative Suite application toolbars or controls, keep your formatting palettes, colors, etc. on a separate screen,… These are just a few examples of what you can do with this powerful time saving device. We promise that once you start using this 7 inch touchscreen USB monitor, that you’ll wonder how you ever lived without it. If you own a computer and use it for more than 45 minutes a day then you owe it to yourself to invest in one of these convenient monitors. Order one now at our competitively low direct-from-the-factory wholesale price and we’ll ship out your order within 24 hours and even include our famous hassle free 12 month warranty. Brought to you by the leader in wholesale LCD and TFT displays, Chinavasion.